NaPDos is a bioinformatic tool for the rapid detection and analysis of secondary metabolite genes. This tool is designed to detect and extract C- and KS- domains from DNA or amino acid sequence data, including PCR amplicon products, individual genes, whole genomes, and metagenomic data sets. Candidate secondary metabolite domains are identified by sequence comparison to a broad set of manually curated reference genes from well-characterized chemical pathways. 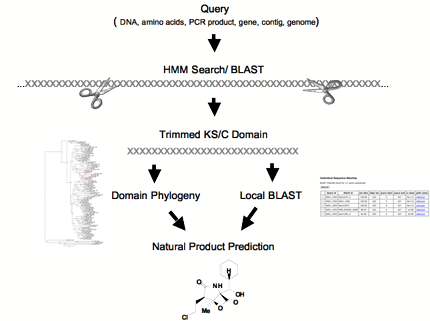 Candidate gene sequences are extracted, trimmed, translated (if necessary) and subjected to domain-specific phylogenetic clustering to predict what their putative products might be, and to determine whether these products are likely to produce compounds similar to or different from previously known biosynthetic pathways. If you find this tool helpful, please cite the reference below. Copyright © 2012 Jensenlab Regents of the University of California. All rights reserved.